Health insurance company Oscar has started its own ad campaign for the Affordable Care Act. These enrollment dates apply to New York state; the dates to enroll in federally run exchanges are Nov. 1 to Dec. 15. Open enrollment for Affordable Care Act insurance doesn't start for another six weeks. But the quirky insurance startup Oscar Health is launching an ad campaign Monday aimed at getting young people to enroll. One poster shows a pregnant woman holding her belly with a bandage on it that says "we're covered." "Particularly in this year of uncertainty, it's really important for us to be in market early and and reassure the 22 million folks that are insured that it is really important to get covered," she tells Shots. Rowghani says the early message focuses on reminding people about open enrollment. The ads include the dates enrollment starts and ends, with the Oscar logo much less prominent. "What we're really communicating is this message of getting coverage — get covered, " she says. The company declined to say how much it's spending on the ads, but did say it's a multi-million dollar campaign. It will run in the six states where Oscar does business, and will be on TV, radio and in subways and buses. That includes in New York state, where open enrollment runs from Nov. 1 through Jan. 31, 2018. But advertising from private insurers won't be able to match the power of the advertising in years past by the federal government, says Lori Lodes, who ran outreach for the Affordable Care Act during the Obama administration as director of Communications for the Centers for Medicare and Medicaid Services. "The reality is there's only so much that issuers and advocates and other folks can do from the outside, because the government, historically, has been a very trusted messenger," she says. Trump's Department of Health and Human Services says it's cutting the advertising budget for open enrollment from $100 million down to $10 million. And it will cut back on grants for navigators who help people sign up for a health plan by about 40 percent to $36 million. The state of California, which runs its own insurance exchange, spent $110 million on advertising around its open enrollment period last year. HHS officials say that most consumers are already aware of the Affordable Care Act and that the outreach isn't as effective as when the law was new. However, the agency this year has made major changes, including cutting the open enrollment period for the 35 states that use the federal website, Healthcare.gov, to six weeks from three months. Open enrollment for those customers starts on November 1 and ends December 15. The plan is to eliminate expensive television advertising and instead focus on e-mail and text message outreach. Lodes says that's a bad idea. "Television not only was the number one driver of enrollment, but it made all those other channels of communication that much more effective," she says. She says the agency tracked which methods of communication were most effective and television came out on top, by far. She says all that research is available to the current HHS leadership. Critics of the move say cutting the advertising and outreach budget while making changes to the open enrollment dates add up to an act of sabotage by Trump and Health and Human Services Secretary Tom Price, who have been vocal critics of the ACA. "Cutting ACA Advertising by 90% is evidence-based policy ... if policy goal is sabotage," Daniel Polsky, executive director of the Leonard Davis Institute of Health Economics at the University of Pennsylvania, said On Twitter. The move fits into a pattern of actions by the Trump administration that have destabilized the health insurance markets and boosted uncertainty over the future of the program. State officials are also concerned. At a hearing earlier this month in the Senate, several state governors said the cuts will likely lead to declines in enrollment. Gov. Charlie Baker of Massachusetts, which has run its own exchange for more than a decade, told the senators that the outreach and advertising in his state was effective. But he added that the state made adjustments along the way. "It's at least as important what you're doing as what you spend it on," he said. "We've tried to do things that move the needle on enrollment and drop the things that don't." Oscar is the first private insurance company to step in to try to make up for government's advertising cuts. Whether others join them — and whether they're effective — will only be clear when open enrollment ends, and the numbers are tallied sometime early next year. Open enrollment for health insurance under the Affordable Care Act doesn't start for another six weeks. 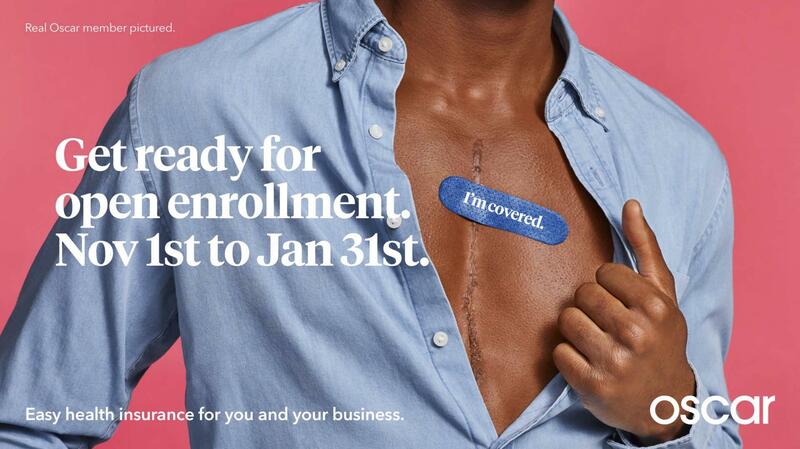 But the insurance startup Oscar Health launched an ad campaign today aimed at getting young people to enroll. The company decided to increase its ad spending after the Trump administration announced it was slashing its advertising budget by 90 percent. NPR's Alison Kodjak has the story. ALISON KODJAK, BYLINE: Oscar is plastering the New York subway system with posters urging people to get ready for open enrollment. One ad shows a pregnant woman holding her belly with a blue Band-Aid on it that says, we are covered. Oscar vice president Sara Rowghani says the company is stepping up in part because the government is pulling back. SARA ROWGHANI: Particularly in this year of uncertainty, I think it's very important for us to be in market early and reassure customers, reassure, you know, the 22 million folks that are insured that it is really important to get covered. KODJAK: Rowghani says the early message focuses on reminding people about open enrollment. The ads include the dates open enrollment starts and ends with the Oscar logo much less prominent. ROWGHANI: We're really communicating this message of getting coverage. 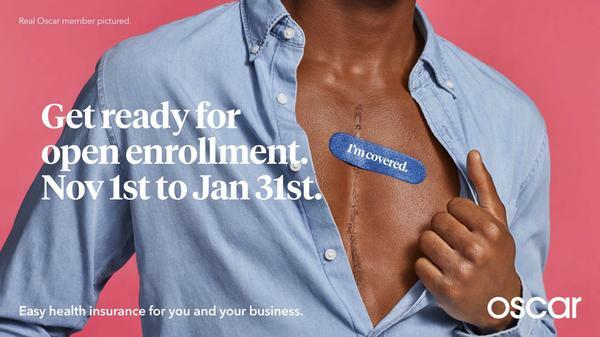 Get covered. KODJAK: The company declined to say how much it's spending on the ads but did say it's a multimillion-dollar campaign. It'll run in six states where Oscar does business and be on TV, radio and in subways and on buses. But advertising from private insurers won't be able to match the power of the advertising by the federal government, says Lori Lodes, who ran the ACA outreach under the Obama administration. LORI LODES: The reality is there's only so much that issuers, that advocates, that folks can do from the outside because the government is a trusted - historically has been a very trusted messenger. KODJAK: Trump's Department of Health and Human Services says it's cutting the advertising budget for open enrollment from a hundred million dollars down to 10 million. And it will cut back on grants for navigators by about 40 percent. Those are the people who help customers sign up for a health plan. Agency officials say that most customers are already aware of the Affordable Care Act and that the outreach isn't as effective as when the law was new. The plan is to eliminate expensive television advertising and instead focus on email and text message outreach. Lodes says that's a bad idea. LODES: Television not only was the No. 1 driver of enrollment, but it made all of those other channels of communication that much more effective. KODJAK: And at a hearing earlier this month, several state governors said they too were worried about the cuts. Montana Governor Steve Bullock was one of them. STEVE BULLOCK: The idea that we'll cut 90 percent of the education dollars and 40 percent of the navigator dollars when what we need to do is draw these people in doesn't make sense. KODJAK: Oscar is the first insurance company to step in and try to make up for the government's advertising cuts. Whether others join them and whether they're effective will only be clear when open enrollment ends next year. Alison Kodjak, NPR News, Washington. Transcript provided by NPR, Copyright NPR.